West Medical Lake has a goldfish problem. 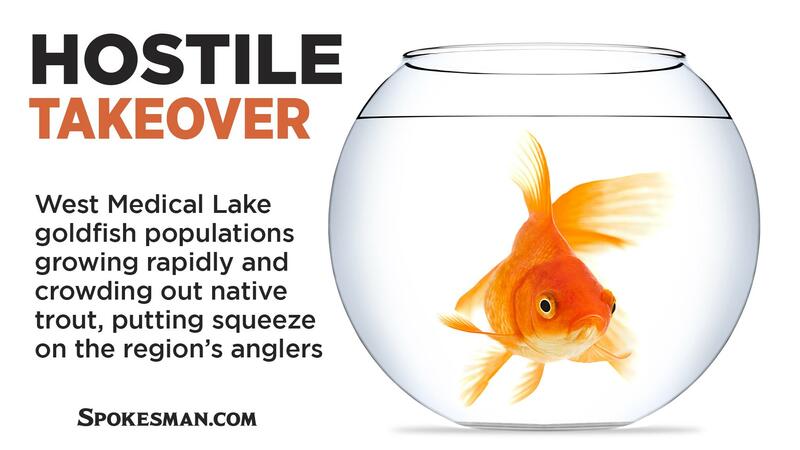 A population of the invasive species, a type of carp, has been growing aggressively in recent years, competing with and ultimately suppressing populations of native trout. And fixing the problem will be no simple matter. Running north and south along the western edge of the town of Medical Lake, West Medical Lake is one of the more popular spots in the region for anglers on the hunt for rainbow trout, which WDFW introduces seasonally. However, the immature, or “fry” rainbows the department generally introduces are being out-competed by a rapidly swelling goldfish population, which Luers said was likely introduced illegally as live bait. A small population – say, a bucket dumped over the side of a boat to avoid confrontation with Fish and Wildlife – can grow exponentially given time, she said. “It’s a reoccurring problem,” she said. Every eight to 10 years the invasive population becomes large enough that it begins to deplete the food, and even oxygen, on which native species rely. And since any countermeasure that targets the goldfish must necessarily affect other species, the only way to get rid of them is to wipe the slate, or lake, clean and start over. The department could introduce larger, more mature trout to the lake, but the process is far more expensive than simply clearing the lake and reintroducing immature trout, Luer said. While the department has yet to make it’s final decision, they officials are considering initiating a lake-wide purge this coming fall. The last time such an action was taken was in 2009, Luers said.